So two days before New years eve I cut out all the parts for the outer shell and I dearly thanked the gods that the lining and the front was already finished. 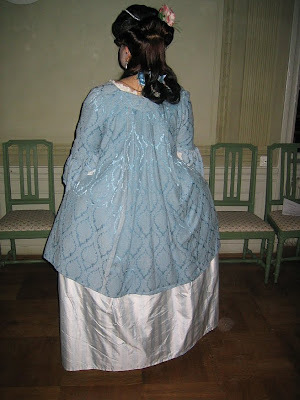 And that the petticoat only needed the back waist finished. Then I started a sewing maraton race that I never want to do again. 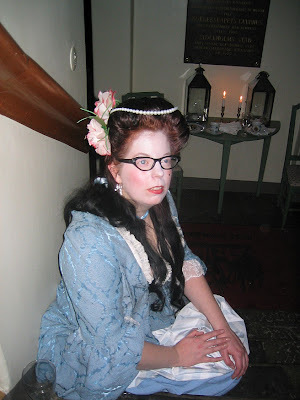 But I did manage and I had something to wear at 12th night ball. It was a great evening and I had so much fun! 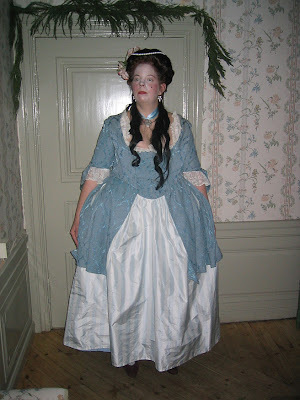 When I realized my time was running out I omitted the ruched and pinked decorations that I planned to have running down the robings and on the stomacher piece. I also sewed the comperes front shut to create a plain stomacher instead. And I only put on the biggest of the three sleeve cuffs. I was a bit irritated at first that I had no decorations, but now when I look at it I think I will keep it like it is. (But make some minor alterations so the inside looks a bit better). And maybe add another row of lace to peek out in the sleeves? What do you all think, pinked ruffle or no ruffle? Here you can see more of my make up.I went for super pale but not stark white. I first covered up my very red nose (it was almost -20 degrees Celsius that night) and other red areas with a green concealer. Then I covered my dark circles under the eye with a pink one and finally I applied a quite generous amount of white mineral foundation. On top of that I put a thin layer of a pearly white eyeshadow to give that fashionable and polished, shiny look. The rouge is a really pigmented pink mineral one and I brushed it quite generously on the apple of my cheeks and dabbed it sparingly above my eyes.I have a wine colored lipstick on but on this picture most of it is gone. The good thing with not having any decorations on this outfit is that I now have 3 yards of light blue silk taffeta that needs a project. I think I will use some for a matching wide brimmed hat and the rest for a jacket....we'll see what I come up with. Din frisyr är mycket tjusig och det blå tyget (som jag inte sett förut, eller inte minns) finner jag väldigt vackert. Fint, med andra ord! I don't envy you your sewing marathon, but the dress turned out very pretty. Perhaps one could do something about the too heavy back if the front is properly attached and not pinned? Yes, It was worth the marathon in the end, but never again. I want my things to made in peace and harmony. Yes, I have also come to that conclusion. I will use the pictures of me in the gown as a guide and attach it properly to the comperes fronts. And add the missing backlacing. Absolutely! SO much more fun! I think that may solve it. My pet-en-l'air is fairly heavy too, and don't seem to sag much, but then the lining is rather sturdy and fit well.